The SAA Glossary defines a donor as “An individual or organization who gives property or money to another without reciprocal compensation,” adding that in many instances, “individuals who donate collections are not the provenance of the collection.” This implies that a donor is not nessarily the creator of the materials being donated to a repository - rather, they are the last legal custodian of the records before they are passed to a repository for long-term preservation. 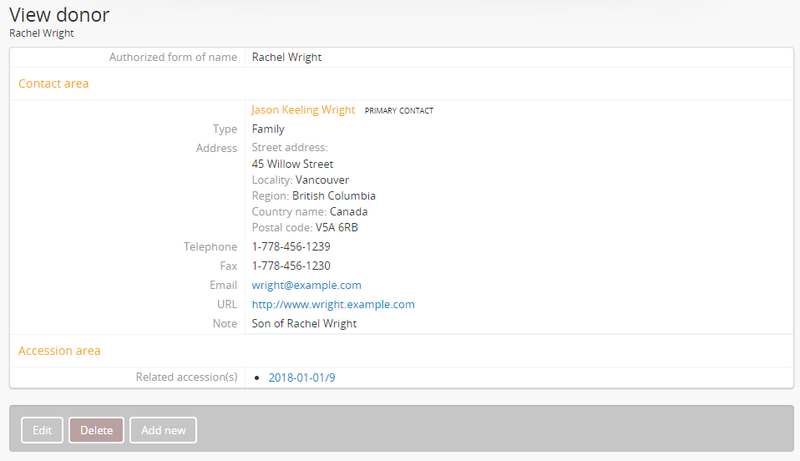 In AtoM, donor records can be used more generically than the SAA Glossary defintion - they can be used to manage records of all individuals who supply records and other materials to a repository, whether freely or with the expectation of compensation. Donor records are a way to maintain a record of the provenance of accessions, so that donors can be contacted in the future if necessary. Donor records can be created independently; more often they are added while creating an accession record via the donor dialog that is available in the accession record edit template. A link to a new Donor record edit template will now appear in the main menu under Add > Donor. For more information on working with menus in AtoM, see: Manage menus. Begin creating a new accession record, or navigate to an existing accession record and enter edit mode. Please see the Accession records page for more information on creating a new accession or editing an existing accession record. 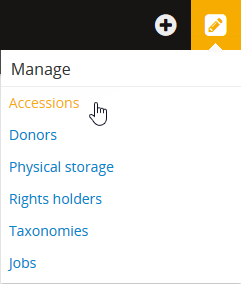 In the accession record edit page, Navigate to the “Donor/Trasferring body” information area and click the “Add new” button. A dialog will pop up and you can enter the names and contact information for related donors using the donor dialog. The dialog allows you to include the donor name and give an alternative contact person. Enter data as required. Once you have completed entering the donor information, click on the “Submit” button to save and return to the accession record edit template. You can add multiple donors to a single accession record by repeating steps 2-4 if desired. If you need to edit the donor information, click the pencil icon next to the donor name in the “Donor/Transferring body area” of the accession record’s edit page; the donor dialog will re-open and you can make changes. Clicking the “X” icon next to a donor name in the “Donor/Transferring body area” will remove the Donor from the accession record. Continue adding and/or editing data in the accession record as needed. When you are finished, click the “Create” (if you are creating a new accession record) or “Save” (if editing an existing accession record) button in the button block of the accession record to complete adding the new donor. AtoM will exit edit mode and take you to the accession record view page. The related Donor’s name will appear as a hyperlink in the “Donor/Transferring body” information area of the accession record. You can click the hyperlink to navigate to the related Donor record. Alternately, you can view all donor records via the main menu by navigating to Manage > Donors. Depending upon your workflow, you might want to add donors to AtoM during the accession process or you might want to add donors to AtoM as a separate process. The first approach (above) is the easiest and most logical. This second approach requires you to create the donor and then add the donor to the accession record - this approach also requires that you have donors existing in the database, otherwise you cannot browse the list and “add a new” donor. In the main menu (located in AtoM’s header bar), navigate to Manage > Donors. AtoM takes you to a Browse menu listing all Donor records. Click on the hyperlink of an existing Donor name. AtoM takes you to the Donor record view page. At the bottom of the record, click on the “Add new” button in the button block. AtoM will redirect you to a blank Donor record in edit mode. 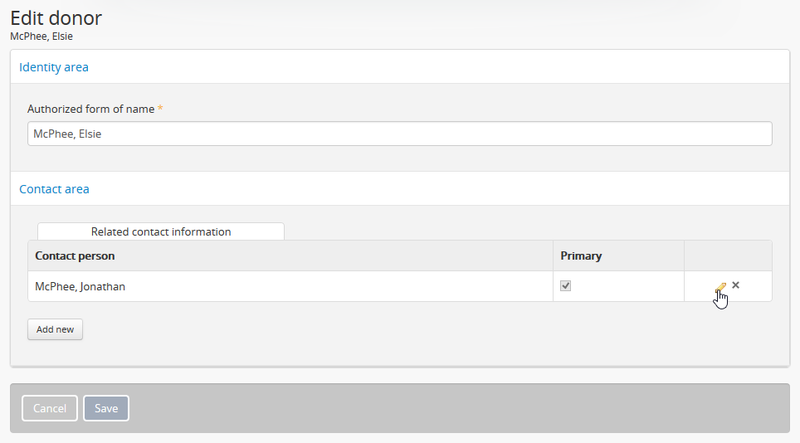 Enter the new donor name and select “Add new” under the contact area to enter contact information about your new donor. 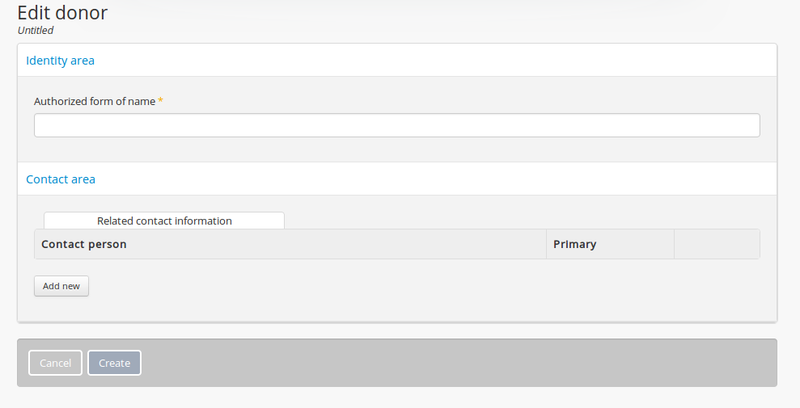 Click “Submit” to close the contact information dialog and return to the donor record. When you are finished adding data, click on the Create button in the button block to save the new Donor record. If you want to link the new Donor record to an accession record, see below, Link a donor record to an accession. Using the main menu located in the AtoM header bar, navigate to Manage > Donors. AtoM takes you to a Browse menu listing all Donor records. With a long list (multiple pages) of donors, you can type the donor name into the dedicated search box, to locate a name quickly and avoid scrolling through numerous pages. You can also sort the list of Donors alphabetically, or by most recently updated. When you have located the Donor record you wish to edit in the Browse page, click on the hyperlinked Donor name. AtoM takes you to the Donor record view page. Click the “Edit” button in the button block located at the bottom of the record. AtoM will open the Donor record in edit mode. Add/revise data as required. You can edit existing information in the Contact information area by clicking on the pencil icon - AtoM will open the contact dialog. *Note that there are three tabs in the Contact dialog for data entry - make changes or additions as required. To close the Contact dialog and save your changes, click the “Submit” button. Note that your changes will not be saved until you save the Donor record. When you have made all necessary changes, click “Save” in the button block. After saving the Donor record, AtoM takes you to the Donor record view page where you can review your changes. If your Donor record is linked to an accession record, you can also arrive at a Donor record for editing by navigating to the related accession record and clicking on the Donor name in the “Donor/Transferring body” information area - AtoM will redirect you to the related Donor record. Follow steps 4-7 above. For more information on locating accession records see: Edit an existing accession record and Access content. The donor dialog will appear. 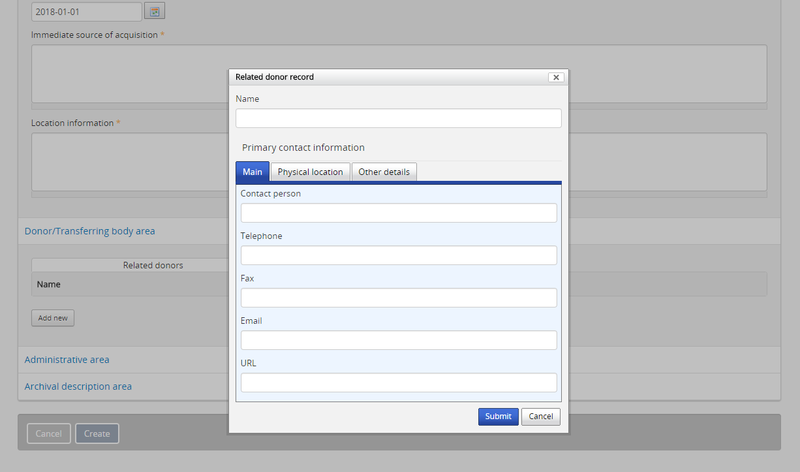 Place your cursor in the “Name” field of the donor dialog, and begin typing the name of the related donor. The name field is an auto-complete - as you type, matching results will load in a drop-down menu below the field. When you see the donor name you would like to link, click on it to select it. This method makes use of an auto-complete field to find the related donor record as you begin to type its name/title. Be sure to pick the record from the drop-down when it appears - if you type the full name and press enter, a new donor record will be generated instead of a link being created to an existing one! If the related Donor record already has the correct contact information, you do not need to add it to the remaining fields in the donor dialog - it will appear in the related fields when you select the Donor name from the autocomplete field for the related Name. Alternatively, if you need to make edits to the existing contact information, you can do so now. When you’re ready, click “Submit”in the donor dialog. To create links to multiple donor records, you can repeat this process as needed. When you are done editing the record, save the accession record by scrolling down and pressing “Save” in the button block. AtoM will reload the accession record in view mode - the related Donor’s name will now appear as a hyperlink in the “Donor/Transferring body” information area of the accession record. Clicking on the hyperlink donor name will take you to the related donor. Navigate to the Donor record you would like to delete. You can do this by using the main menu located in the AtoM header bar and navigating to Manage > Donors and then selecting Donor record from the browse list (or searching for it with the dedicated search bar for Donor records provided on the Browse page). Alternately, if your donor record is linked to an accession record, you can navigate to the related accession record and use the hyperlinked Donor name to redirect AtoM to the desired Donor record. When you have arrived at the Donor record’s view page, click on the Delete button located in the button block located at the bottom of the record. AtoM will ask you to confirm that you want to delete the Donor record. Click the “Delete” button to delete, or the “Cancel” button to return to the Donor record view page. If you click “Delete,” the Donor record will be permanently deleted.